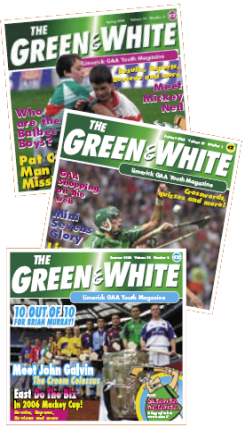 The Green and White magazine was launched in autumn, 1996. From the outset, the focus of the magazine has been on Cumann na mBunscol activities in Limerick City and County. Feedback from readers is valued. Readers' input has helped to shape the magazine in terms of the style and content. The result of this is a magazine crammed full with features on GAA at all levels locally-and beyond. The design is bright and contemporary, thus ensuring that The Green and White is not outshone by the myriad of glossy magazines promoting other high-profile sports. Special features such as quizzes, crosswords and cartoon strips compiled exclusively for the magazine give it a unique profile all of its own. These features rate very highly in reader surveys. There are 3 issues each year. That's a new issue every school term. 5,000 copies of each issue are sold. Most are sold, at cost price, directly to Limerick GAA clubs. Clubs, in turn, arrange for the distribution of the magazines through their local schools. This has proved an excellent means of fostering and/or enhancing a strong school/club link. Schools and individuals not linked with a GAA club can purchase magazines by contacting Gerry Bennis (details below).